Become a Palm and Cycad Expert! Palms are a very important group of plants, primarily throughout the tropics. There are palms growing successfully in cooler places throughout the world, including Tasmania, England, Canada and Cape Cod in the USA. Many palms however are not particularly hardy to the cold, and will be injured by temperatures approaching freezing point. In temperate climates, palms are also often grown as indoor plants. A PBL assignment where you deepen your knowledge by planning the establishment of a collection of different cultivars of palms or cycads (your choice) that are suited to growing in a particular situation or locality. At first glance all palms might look the same; a closer look however will highlight significant differences between one variety and the next. Trunks can be smooth, ridged or even prickly, with the dead bases of old fronds either clinging to the trunk or completely removed. Fronds can be large of small, fan shaped or feather like (deeply divided like a fern leaf). Foliage and trunk colour can vary also, and though most palms have mainly green foliage with shades of green, brown or grey in the trunk, there are species with shades of red, yellow, white and other colours. 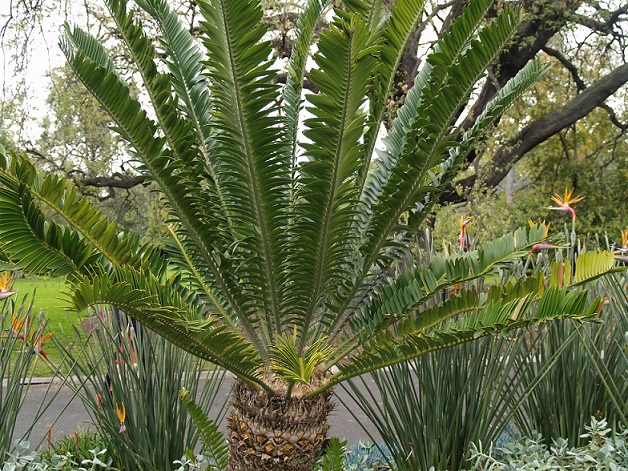 The large fan or feather-like fronds can provide an excellent contrast to smaller leaved plants. As they grow, their shade gives a dappled effect to understorey plants, providing an excellent growing environment. The trunks may be a main feature or they can be used as a host support for epiphytic plants such as orchids, ferns (elkhorns and staghorns) and climbing philodendrons. With such a huge range available, anyone can create that wonderful, tropical, relaxing effect, of swaying palms and rustling foliage, as the wind gently blows through the fronds. 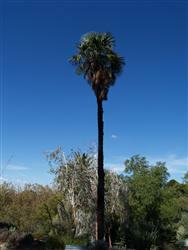 Most palms, except the drier inland species, require moist soil conditions with good drainage. The soil should not be allowed to dry out totally. Palms, especially those from rainforests, can handle the occasional short waterlogged period. The soil is best if slightly acid – pH 6.0 to 6.5 – though palms can handle a wide range of soils from clay to sand. Being hungry feeders, compost enriched soil or fertilizers may be needed. High nitrogen fertilizers with an N-P-K ratio of 10-3-6 are regarded as the best and should be applied in spring, summer and early autumn at a rate of about 3 to 5 kg per square metre. If older fronds become yellow, this indicates a nitrogen deficiency which can be corrected with fertilizers such as sulphate of ammonia. 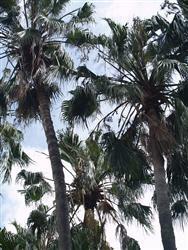 Dead fronds are frequently removed to keep palms looking tidy and to prevent them dropping onto people, cars and so on. If fronds are cut back while still green though, this can set the plants back and slow growth. Because their trunks are so flexible and bend in the wind, tall palms are less likely to blow over in a strong wind than a similar size woody tree.